Celebrate America's Night Race in style by winning one of three great prizes in the Red, White, & Bristol promotion! The Speedway has collaborated with its many great partners to give away prizes, passes, and experiences that'll excite any NASCAR fan! To see the entire PRIZE LIST for this promotion, CLICK HERE. 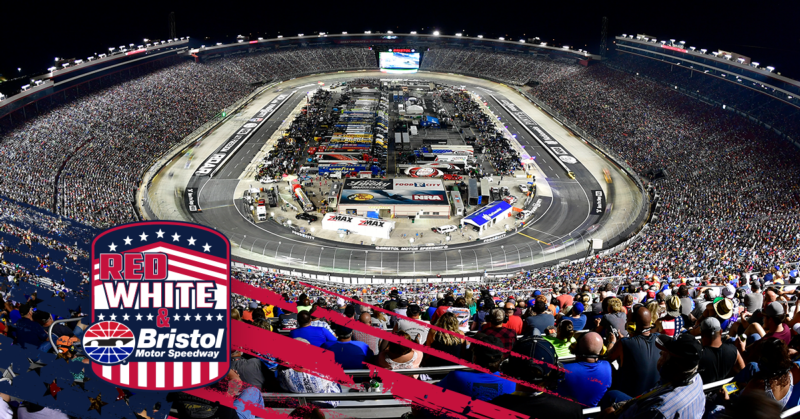 Fans are able to register for the Red, White, & Bristol promotion until 11:59 p.m. on Sunday, July 22. Only one entry is allowed per person. Winners will be drawn on Tuesday, July 24. Bristol Motor Speedway would like to thank the following partners for participating: Bass Pro Shops, Food City, Chevrolet, Bush's Beans, Honda Power Equipment, Busch Beer, Durango Boots, Buck Baker's Seat Time Racing School, Ruby Falls, The Western Front Hotel, and Ole Smoky.